, the jetpack has remained the single benchmark of futuristic technology that mankind has only barely been able to crack. The good news is that we are getting closer. Over the past few years, various attempts have been made, from initial prototypes to devices that can aid emergency service workers or even jetpack-style devices that can help people to run faster. While that's good, that's not what the people want - we don't want the power of flight to come with a responsibility to help other people and use the technology for the betterment of mankind. If anything we want jetpacks to be just useless enough to be fun and enjoyable, without making them dull and commonplace (and we certainly don't want to have to run anywhere). Note the device's form here - Cordia has essentially made himself a prototype Iron Man thruster set, with jet engines strapped to his back and legs to help him glide through the air with maximum efficiency. It's the closest any of us will get to being Tony Stark without growing a little goatee. The only downside to this jetpack wing suit is that it required a hot air balloon to get Cordia to a high enough vantage point (in this case, around 5000 feet) before he could actually use it. This is the classic Buzz Lightyear form of "flying" - falling with style, made all the more majestic by the fact that Jarno has some degree of control over his movement in his initial descent before pulling his parachute cord and coasting the rest of the way down. Thanks to the use of these thrusters, Jarno was able to sail across the sky for almost three minutes of unaided flight without losing altitude before he deployed his parachute - even actually gaining a little altitude before doing so. 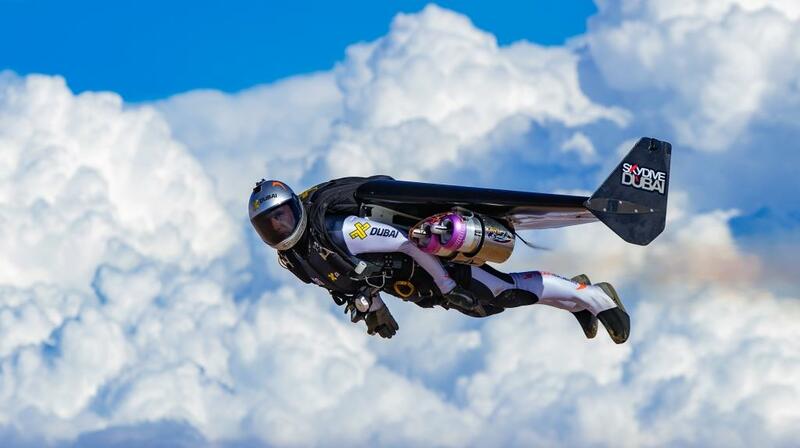 This device, plus the wingsuit, at present don't offer anything meaningful in terms of upward thrust, but it is good news for those of us who still dream of suiting up without very own jetpacks and blasting off into the sky. We're getting close to the point where jetpacks offer meaningful potential as flight suits for human beings, and that means that the full, unadulterated future we've been promised since we were kids is finally almost upon us.